A feature of the new 3ds handheld that does get mentioned but is generally overshadowed by the lenticular lens 3d screen is its network capabilities. StreetPass may seem an odd concept but in terms of ensuring you have the console on your person at all times and powered up it is fascinating. What StreetPass does is keep the 3ds wireless running whilst in standby but in a low power mode. 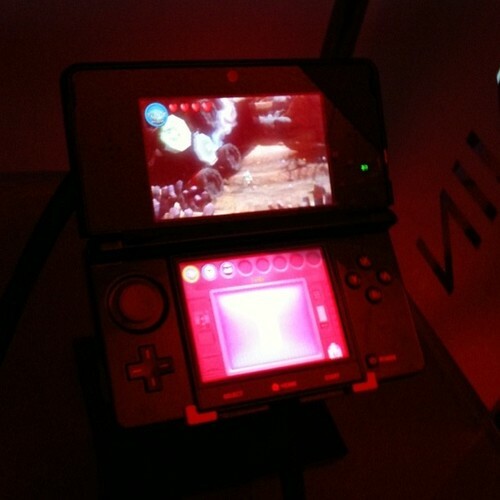 It looks for other 3ds consoles within about 30 metres of it at any time. Why? Well it does this so that if a fellow 3ds owner passes you in the street the two machines will exchange data with one another whilst sat in you bag or pocket. It is a form of digital business card exchange. 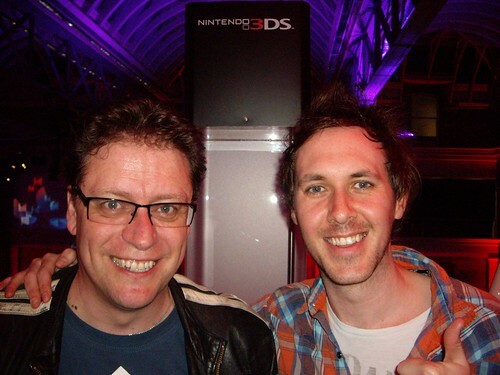 Nintendo have, with this, gone and invented a whole new dynamic to social gaming in a networked world. You often bump into gamers online in games that you play at the times that you play them. i.e. fully distributed networks. 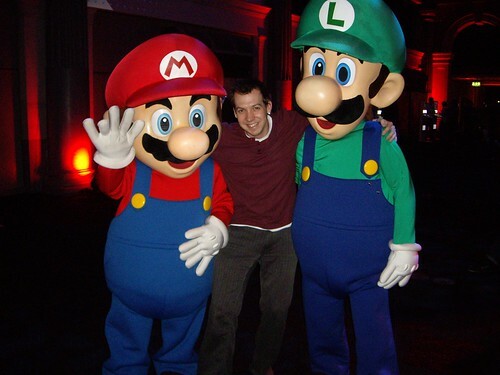 With StreetPass you are bumping into gamers at a time and physical place which gives you something in common, and hence makes that person of interest. What interested me, aside from the tech, was how this felt. 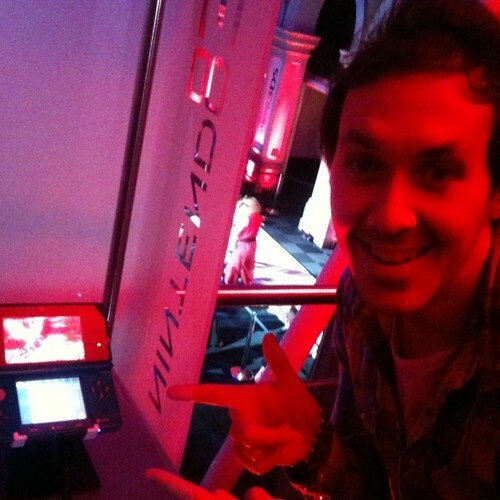 Whilst I was in London heading back from the BBC I had my 3ds on standby in my pocket on the tube. I actually got off at a stop I did not need to, in this case picadilly circus, and walked down to leicester square in order to see if my StreetPass would connect with anyone. This physical activity did in fact yield a few StreetPass exchanges. So when i got back on the tube train I was able to see a few Mii’s (the little avatars you create as a calling card/game character) now residing on my handheld. One was even from someone form Spain. My epredator Mii had also been delivered to them of course. I had, as an experiment also put Feeding Edge Ltd as my greeting so it was a kind of advert ! 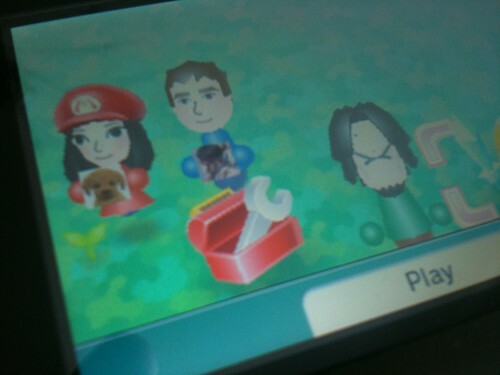 These Mii’s also come with things that relate to games, such as a specific piece of a puzzle, or they can be used to drive a mini game. We are only scratching the surface of how this will pan out. I had been playing a bit of Street Fighter IV which is tremendous game on the DS and has been crafted superbly. Part of that is the ability to win in game figures. These figures form part of a collection that can be traded wirelessly, but more excitingly you are able to assemble a fantasy fighting team from the figures.You are given a certain number of skill and attribute points that you are allowed to spend and then the different figures and characters can be user to create the team. 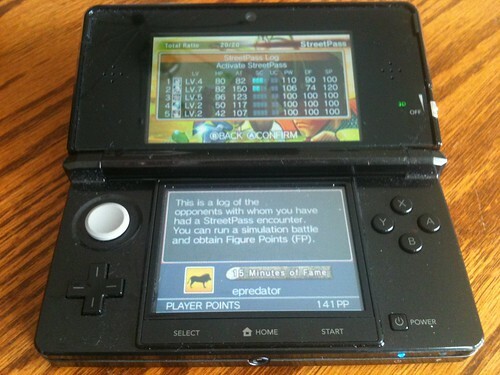 Once created this can be StreetPass enabled. I obviously wandered past a fellow SF IV player as we basically exchanged team data. Once you spark up the game again it asks if you want to run the simulated battle using this data. I did, I won 🙂 in winning I gained some more currency to spend on more in game figures to build the team. It’s almost like play by mail rock/paper/scissors with a huge techie twist. Just to complete the behaviour altering loop though the 3ds also acts as a pedometer. It counts your steps, the more steps you do the more game coins you are credited with. These game coins can be used to purchase in game items. In the case of SF IV it is, yes you guessed it, more game figures to build the team with. 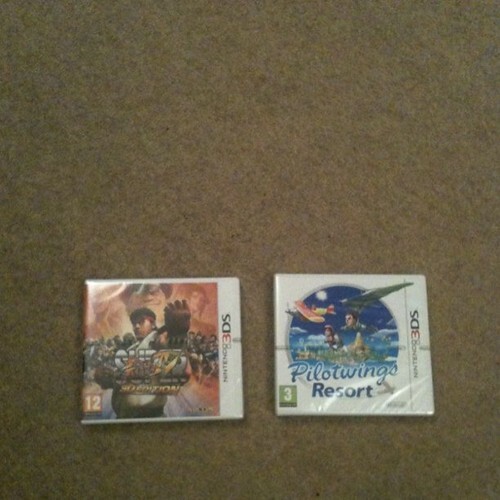 So, I was carrying a 3ds in my pocket, deliberately walked through the centre of London to see how it worked, gathered some other gamers data, played an offline game with that data which earned me more game points to be able to do that again and the act of walking wash also gaining those game points too. I think this is going to be a fascinating twist, and may surpass the 3d elements of the nintendo handheld. It has shades of the Wiimote for being genre changing. In a world of online social games they have reintroduced the physical environment to the mix and I am sure some very cool ideas will spring out of that. 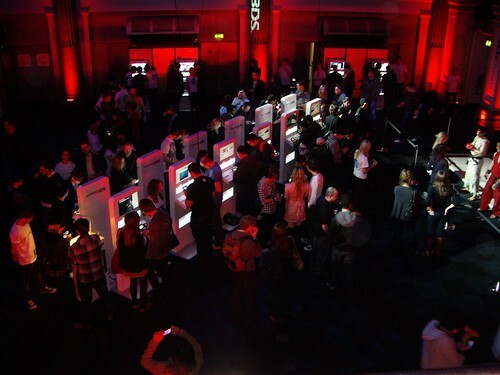 Thursday night I headed to London to meet up with some of the Cool Stuff Collective team as we had VIP media tickets to the Nintendo 3DS launch event. 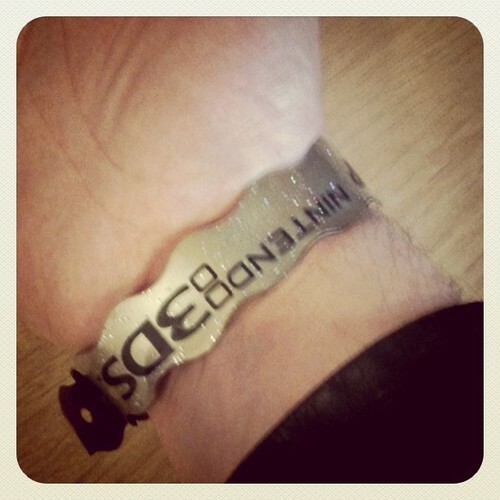 This was of course a very exciting invite. We were not filming anything, but the chance to mingle, to play some pre-release games and to be at a great music gig too was impossible to say no to! I am sure many media people go to these things all the time, but for me it was a bit of a novelty. We had to stand in a short queue the other side from the actual red carpet. Jodie Kidd was just arriving as we got there so it took a little while for the photographers to finish before we snuck in past them. 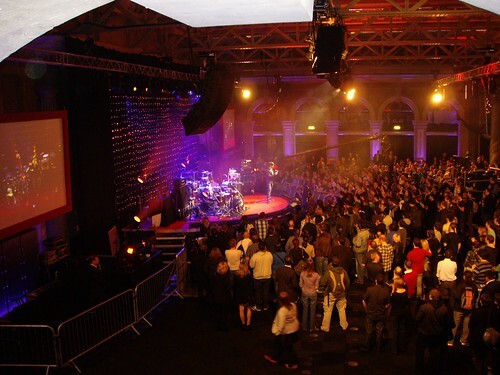 The venue was the Old Billingsgate hall on the bank of the Thames. After a little bit of confusion about names on the list (there were five of us, a small amout of “don’t you know who we are” we were ushered, given a gold write band and headed up stairs. It was a very impressive set up. There were on the mezzanine level (where you needed the wrist band) stand after stand of 3DS with every game there is for it, so it seemed. We were suspended above the main floor where there other party guests and competition winners were able to play on even more machines. We had to do the usual set of party pictures. Matt got to meet some fellow costume based performance artists too. The 3DS is really great and I can’t wait until my one arrives (cough… Amazon !!!! you missed the release data). Hadukon got the energy level up with a great set but I really was looking forward to seeing Plan B. They were absolutely brilliant live! DJ Yoda did a fantastic set after that too and took us off into the night.